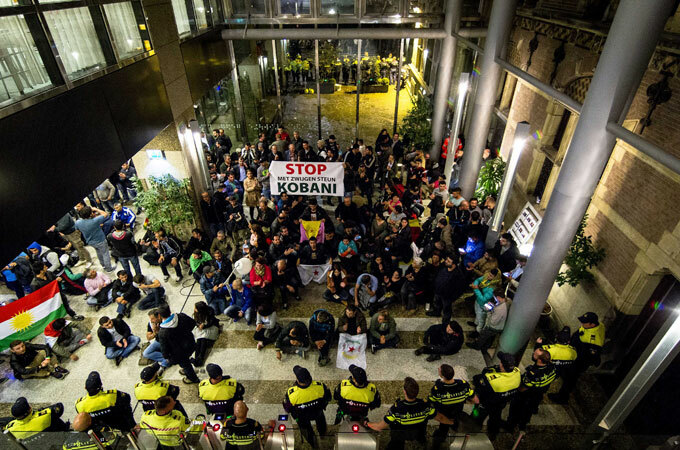 Over 200 Kurdish protesters have occupied the Dutch parliament building, calling for more action to combat the Islamic State in Iraq and the Levant (ISIL) group. The official Twitter feed of The Hague police said the demonstration late on Monday was peaceful and that officers were in talks with the protest leaders, the AP news agency reported. Police advised the public not to go to the square outside parliament. Kurdish protesters took to the streets in several European cities on Monday evening, including Rome, London, Vienna, Cologne and Stockholm, where protesters reportedly occupied a building at the city’s international airport. Dutch National broadcaster NOS posted video on its website showing chanting protesters inside the parliament building holding a banner that said in Dutch “Stop the silence. Support Kobane,” a reference to the Syrian town close to the Turkish border that was under attack on Monday by ISIL fighters. Dutch F-16 fighter bombers on Sunday began flights over Iraq and were ready to join the campaign against ISIL, the defence ministry said on Sunday. The planes are now “completely ready to be deployed over Iraq”. The F-16s will be used as close air support, backing up Iraqi and Kurdish ground troops fighting ISIL. The Netherlands has said it would not join air strikes in Syria without a UN mandate, the AFP news agency reported. The US has been building an international coalition for an air campaign against ISIL since first launching air strikes in August. Britain and France have joined the strikes in Iraq and five Arab nations – Bahrain, Jordan, Qatar, Saudi Arabia and the United Arab Emirates – have taken part in Syrian raids. The Netherlands has sent six F-16s to take part in the campaign, plus two in reserve. Apart from the F-16s, the Dutch will also deploy 250 military personnel and 130 trainers for the Iraqi military.